Johnny Depp cements his love for Hunter S. Thompson on Blu-ray on Valentine's Day. 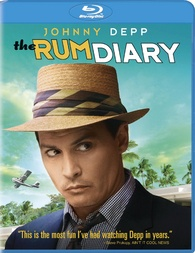 In an early announcement to retailers, Sony is readying 'The Rum Diary' for a Blu-ray release on February 14. The Blu-ray will feature 1080p video, a DTS-HD Master Audio 5.1 soundtrack, and supplements include: A Voice Made of Ink and Rage: Inside The Rum Diary and The Rum Diary Back-Story. You can find the latest specs for 'The Rum Diary' linked from our Blu-ray Release Schedule, where it's indexed under February 14.